This is one of those recipes I've had for a long time and enjoy making for the holidays every year. 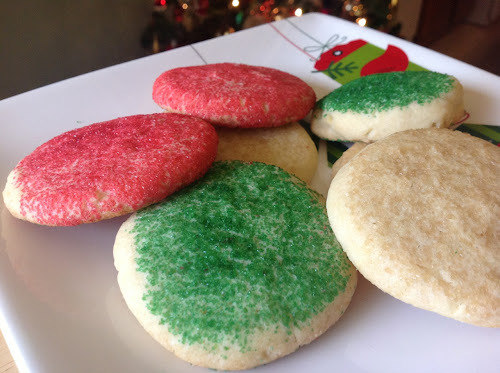 The combination of confectioners and granulated sugar, plus a decent amount of butter, makes for an amazing cookie texture. It's from Mary Engelbreit's Cookie Cookbook, published in 1998. I'm not sure where I got the recipe, since I don't own the book, at least not yet (I just ordered the last used copy at Powell's). Just before putting the cookies on the baking sheet, I like to roll their tops in green and red colored sugar. You could also use turbinado sugar. 2. Beat butter and sugars together until light and fluffy. Beat in the egg, vanilla, baking powder and salt. Add the flour and beat on low speed. 3. Roll pieces of dough into 1-inch balls (I usually make mine a little larger than an inch). 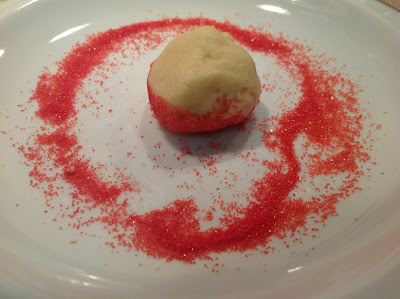 Spread demerera or colored sugar on a plate. 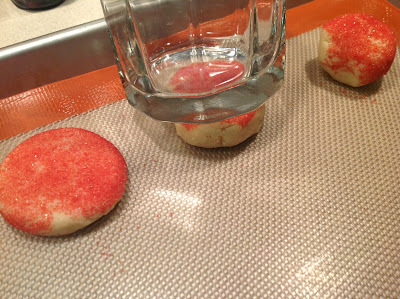 Dip each ball in the sugar, place on a baking sheet with the sugared-side up and flatten each ball with the bottom of a glass. Bake about 10-12 minutes until golden on the edges. Allow to cool slightly then transfer to a wire rack to cool completely. Of all the cookies you make, I think this is my favorite. Why oh why did I already blow my way through this year's supply?! Now here it is Christmas Eve and I have none to eat. I'm an idiot!